Gregg Alger and his wife Mary didn’t always realize the importance or value of soil in the winemaking process, but they’ve learned that it’s one of the keys to making drinkable wine that brings customers back for more. The timing turned out to be perfect. Gregg knew he didn’t know much about wine, but realized the potential and signed up for Oregon State University’s viticulture and enology program. 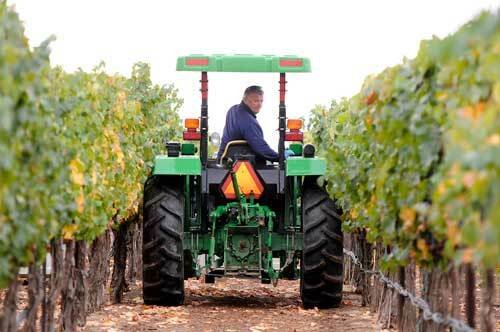 At the same time, he started preparing to plant the vineyard that would become Huston Vineyards. Although the formal education proved to be useful, Gregg says that the practical experience of learning in his own vineyard was even more valuable. Although the Algers have ample acreage for vines, they rely on a number of off-site properties to grow grapes. Gregg isn’t a fan of estate wines; instead he believes that grapes blended from multiple sites can bring complexity that a single varietal can’t offer. The majority of sites are in the Snake River AVA, although Gregg says that the extreme weather in 2014 forced him to source grapes from Washington. “Each relationship with off-site cooperators is a bit different,” Gregg explained. “Some are growers and I purchase the grapes, and I rent ground from others. I also own some of the ground, and others are tonnage contracts.” But because Gregg’s passion is the process of growing, he is very particular about the grapes from each source, and spends time with each grower, on each farm, to define what he wants. The Chicken Dinner label was almost too easy. It’s the name of the road the winery is on, and Gregg realizes that they couldn’t have spent money and come up with a better label. “Our Chicken Dinner theme, which has grown extremely fast, may include fruit from other AVAs,” said Gregg. In addition to overseeing the growing process and making wine, Gregg enjoys the business and marketing side of the winery. The Algers self-distribute, and have worked with local chefs to get Snake River AVA wines into area restaurants. Visit Huston Vineyards on line at www.hustonvineyards.com .